"I wish I would have found this bowl long ago. I will not use a standard bowl again." I never thought I would give a dog bowl a review, cuz a dog bowl is a dog bowl, right? Not in this case! This bowl is far superior because of the bonded rubber ring on the bottom. It doesn't slide or make noise while the eager dog is feeding, and the overall construction is heavy duty. I wish I would have found this bowl long ago. 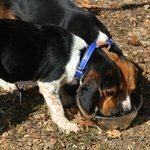 I will not use a standard bowl again. Griffon korthal. Hunts. Family pet. "Perfect size for a large working dog. " Perfect size for a large working dog. 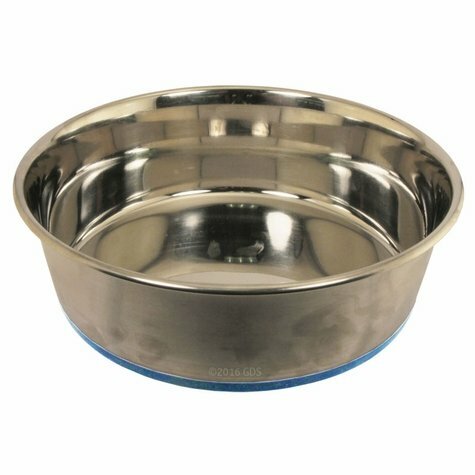 Easy to clean, and the bowl does not slide around the kennel while the dog eats. "Perfect size bowl for in the house." Perfect size bowl for in the house. Nicely polished, and it stays put! I have the larger size as well. These are big enough for 4 or 5 cups of food. 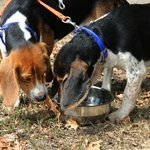 They are small enough to feed in crate or truck crate. Well made! I bought two of these bowls. They are perfect in every way and are a good price. I recommend them. I have every confidence they will last forever. I knocked off one star because on one of the bowls the sticky label had dried out and left all the glue behind on the bowl. I have tried various cleaning soaps and a couple of solvents, but nothing removes it. On the other bowl the label peeled off easily and left no residue. Holds approx. 64 fluid ounces or 8 cups.